It was a business halt for the International airline as activities were temporarily stopped last evening at the arrival section of the Murtala Muhammed International Airport (MMIA) , Lagos, following the unruly behaviour of some aides of the Nigerian musician, David Adeleke aka Davido. Kayode who is one of Davido’s aides, became upset and beat up an official at the airport who asked him to produce his baggage tags at the airport today, later beat up officials of the Nigeria Customs Service (NCS) , Aviation Security (AVSEC) , a department under the Federal Airports Authority of Nigeria (FAAN) and a staff of Checkport over an attempt to check the tags on the checked luggage of Davido on an Emirates flight. Information letter reached us that Davido who had arrived the country through an Emirates flight around 5 pm, had 17 checked luggage, which the aides refused to allow the officials of the Checkport verify with the attached tags. Crisis broke out when a Checkport staff at the airport attempted to verify some of the checked luggage with the attached tags, but, rather than allow the staff to carry out his official duty, the aide (Kayode) insisted that he would not allow him to verify the luggage, which after much arguments and insistence, led to fisticuffs. 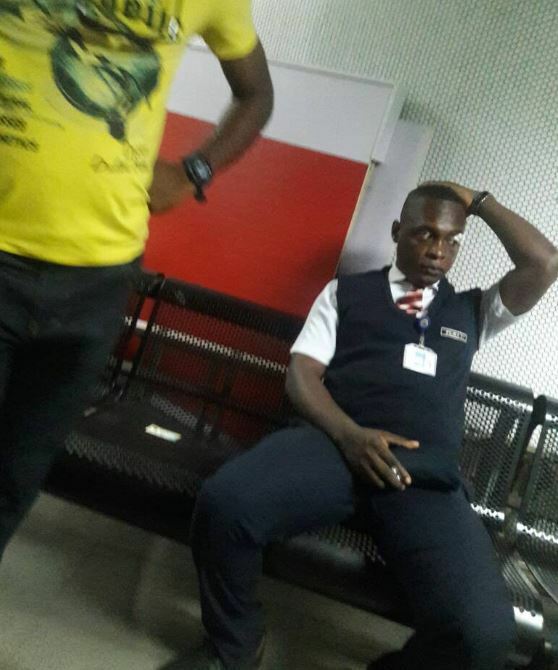 Kayode punched the Checkport staff on the face, which attracted other security officials at the terminal who immediately attempted to arrest the aide. But, rather than obey, he resisted arrest and pummelled another airport staff at the baggage claim area. Tango City is a place where touts and unruly persons are detained within the terminal before being transferred to a police station for further a possible interrogation and possible prosecution. At Tango City, the aide allegedly continued his attacks on security officials by hitting a female AVSEC official who was taking notes of the incident in the tummy and later pushed another Customs personnel who landed awkwardly and cut his wrist in the industrial fan in the area. As all these were going on, Davido was aware of the on-going crisis inside the terminal ran to hide in a car outside the terminal where he awaited the release of his aides and luggage in vain having mobilized some officials with cash to take care of the problem. An eyewitness told our correspondent that the entire 17 luggage belonging to Davido are yet to be released to him and information gathered indicated that one of the luggage might contain a huge sum of cash in foreign currencies. As at the time of filing in this report, it was not clear if the aide had been transferred to the State CID as threatened by the security officials, but it can be established that the luggage are still being withheld by airport security officials. The eyewitness said: “Whenever Davido arrives the airport, he usually leave his check-in luggage for his aides to clear. Immediately he arrives on a flight, he goes out and will start doling out money outside the terminal. “Today, he arrived as usual with several luggage and about 17 in all. The rule is that whenever you arrive, you are expected to release your tags to the Checkport staff for confirmation and verification, but rather than comply with the simple rule, one of his aides insisted he won’t allow them to check the tags. “He rebuffed everyone who were carrying out their lawful duties and resorted to attack the officials. No fewer than four officials were beaten by the person in question with at least two of them soaked in blood. “When he was uncontrollable, he was bundled into the cell and he insisted that he must be taken to a police station. This however, attracted Davido’s attention who was already out of the terminal.